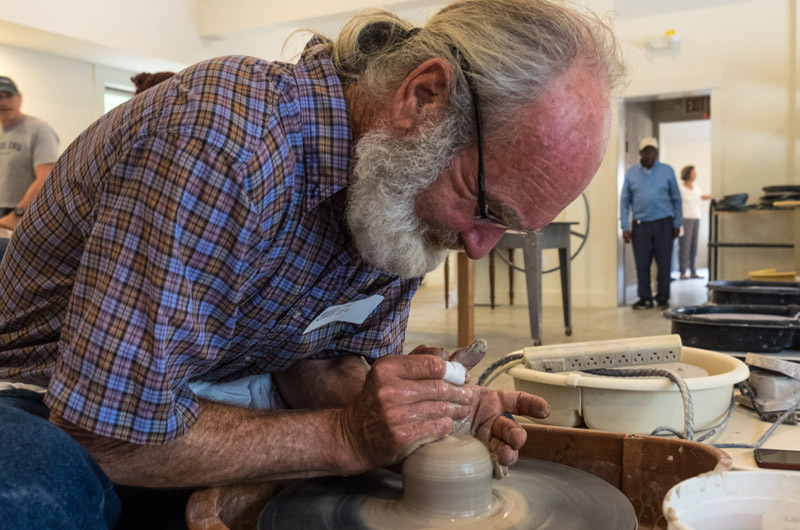 There was much excitement in the air on Sunday as the ribbon was cut on a new pottery studio at Featherstone Center for the Arts. 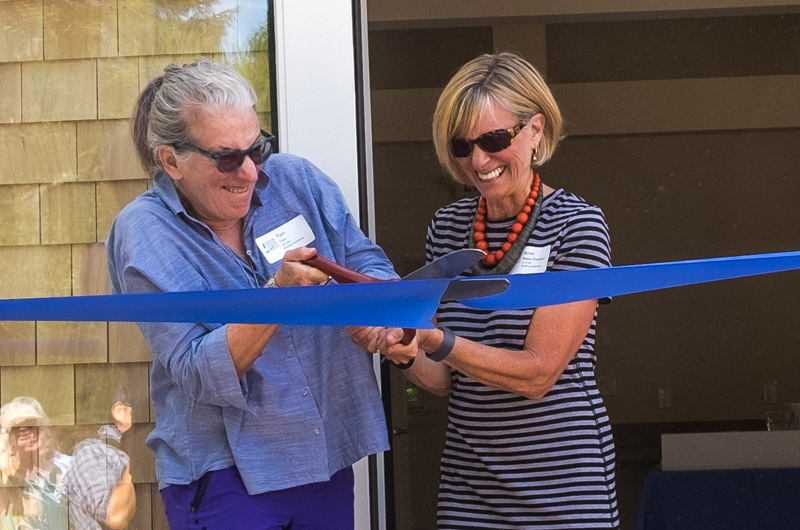 Thanks to a generous gift last year, the Oak Bluffs art center launched a major campus expansion over the winter. 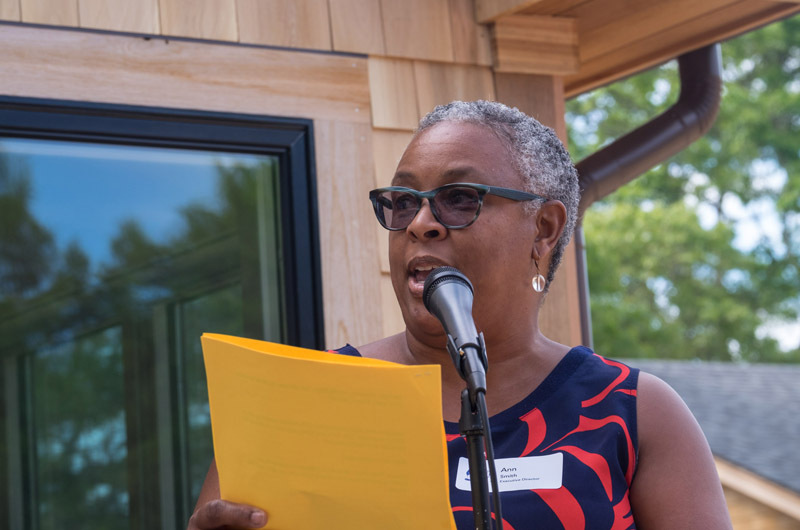 “I’m beside myself, I’m absolutely beside myself,” said a woman who sat on the back deck just before executive director Ann Smith came to the microphone to welcome those who had gathered to see the freshly-completed studio. After thanking a long list of Island businesses, volunteers, board members and staff for “steering the ship and staying the course,” a ribbon was cut and the public was invited into the studio for the first time. The new pottery studio is just one part of Featherstone’s campus expansion and a separate building from the Art Barn which includes drawing and painting classrooms and the Francine Kelly Gallery. The buildings were designed and built by Squash Meadow Construction. The pottery studio features a long table for hand building, 10 wheels, four kilns with more in the works, two slab rollers, a glazing table and lots of shelves along the walls. At 2,400 square feet, the space is triple the size of the old one. Sabrina Kuchta, a pottery studio manager, said the new space lends a sense of professionalism. And the expanded size will allow for more breathing room.“We loved our old space but it was cramped,” Ms. Kuchta said. “Seventeen years worth of issues have been addressed here,” said Frank Creney, the studio’s other manager. A permeable porch was built outside where a new gas kiln will be installed and more sinks were added inside. “We went from horse barn to penthouse,” he said. The event also served as the launch of the public portion of Featherstone’s $6 million capital campaign, with $2 million left to raise. The campaign was boosted by an anonymous bequest of $2.89 million received last July, $1 million of which was allotted for the new art barn. The Art Barn will be opened to the public in mid-August. Yipee! Can't wait to get in to work! I know my parents would so thrilled to see everything growing and thriving. Alive with excitement and imaginations entangled. Congratulations!!! !